I sneeze like an amplified space duck. I've never been one of those girls who can somehow sneeze where it sounds like a little kid saying "choo!". No, when I sneeze it sounds like I am screaming "CHAAAAA!!!". Then, when your heartrate has somewhat settled, there comes a second one. I'm sick this week and my new coworkers have discovered that, like everything else I do, I blow my nose and cough with 100% enthusiasm. A coworker once apologized to me for not leaving the cubicle one time when she (super delicately) blew her nose. I laughed in her face. The last few days I have been averaging roughly a kleenex box a day and if I left my desk every time I blew my nose, I would never even make it back to my desk by the time I had to leave again. Office Robot sits on the other side of the cubicle wall at the new place. I could almost hear him giving a small sigh every time I blew into a tissue with gusto. He doesn't understand because he's never been sick and has no nose. 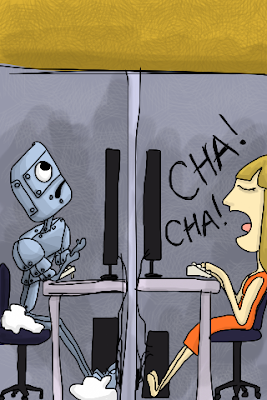 The moral of the story is: if you aren't a robot, I think it's okay to blow your nose at your desk. And that's not just because I need to justify that I am doing it.